phpMyProxy is a free, light and powerful php-based proxy script. The script is free and released under a GNU GPL Version 3, so you’re pretty much free to use, share, modify, redistribute, etc. The proxy script is fast and secure, requires a little server resource, encodes web address, supports Gzip Compression to save bandwidth, works with HTTPS (Secure HTTP) connections and provides very easy customization (language translation and template modification). phpMyProxy script requires PHP 4.0.2 or higher with cURL installed and session support. 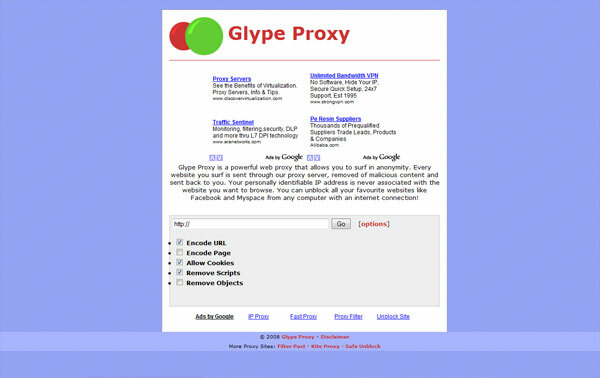 Glype proxy script is a free-to-use, web-based proxy script written in PHP. Similar to a typical proxy server, a web-proxy script downloads requested web pages and files and forwards them back to the user. The service is provided by a web page itself, which allows instant access to the proxy without editing your browser connection settings. Web proxies are commonly used for anonymous browsing and bypassing censorship restrictions. There is a huge market for these sites and glype proxy allows webmasters to quickly and easily set up their own proxy sites. The glype proxy script requires PHP5 (or greater) with cURL enabled. CGIProxy is a CGI script that acts as an HTTP or FTP proxy. Through it, you can retrieve any resource that is accessible from the server it runs on. This is useful when your own access is limited, but you can reach a server that in turn can reach others that you can’t. In addition, the user is kept as anonymous as possible from any servers. Common uses include: anonymous proxies similar to The Anonymizer, other personal uses, VPN-like functionality, and others. It’s very simple to install, and very configurable. When an HTML resource is retrieved, it’s modified so that all links in it point back through the same proxy, including images, form submissions, and everything else. Once you’re using the proxy, you can browse normally and (almost) forget it’s there. Configurable options include text-only support (to save bandwidth), selective cookie and script removal, simple ad filtering, access restriction by server, custom encoding of target URLs and cookies, and more – there are more than 50 options so far. The script can run under mod_perl unchanged and requires Perl 5.6.1 or later. 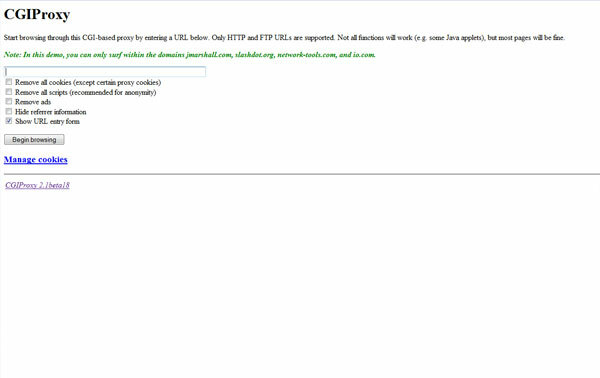 Zelune is a free web proxy script claiming to be the worlds fastest web proxy script. The script is PHP based and also requires a MySQL database in order to operate. It is easy to install and customize so you can have it up and running in just a few minutes. 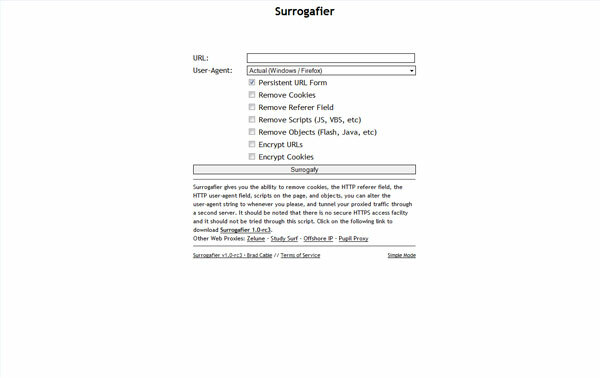 Surrogafier is an easy to install three tier web proxy written in PHP. Features include the ability to remove cookies, the HTTP referrer field, the HTTP user-agent field, scripts on the page, and objects, altering the user-agent string to whatever you please, and tunneling your proxied traffic through a second proxy. If there is a second public install of this script, two standard proxies could be used, one entered in the proxy settings of your browser, and one entered into the publicly installed web proxy, to create a connection being passed between three separate proxy servers before hitting the final destination. AJAX applications might have problems with Surrogafier! Currently, SSL/TLS is supported through just entering a URL in the field (for opening secure web pages).